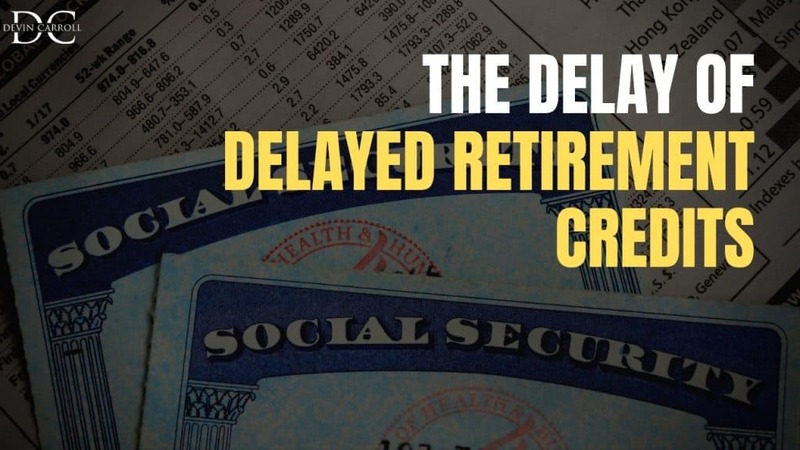 Today we’re taking about delayed retirement credits and how they get added to your benefit. If you plan to file after your full retirement age, you may be disappointed when you get your first check because those credits aren’t added right away. Let me explain what you should expect and when to apply for benefits to minimize this delay. It appears that the Social Security Administration have a little trick up their sleeves. They do not add your credits immediately if you file after full retirement age. Now, this is a little puzzling to me and I’m not sure why they do this. It’s not as if they don’t have the systems in place to do the calculations. After all, if you file early, the reductions are applied immediately! I’m going to show you how this works but let me give you a little context around this first. I often discuss the monthly reductions for filing early or increases for filing early, and understanding that is a fundamental part of today’s discussion. You can file for your retirement benefits between the ages of 62 and 70. 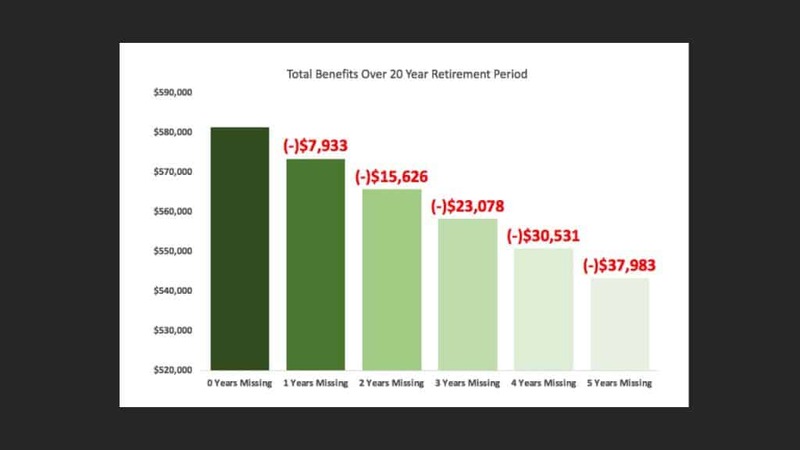 If we imagine the red line is your full retirement age, your benefit is increased if you file after and decreased if you file before. The decreases are broken up into two separate bands. 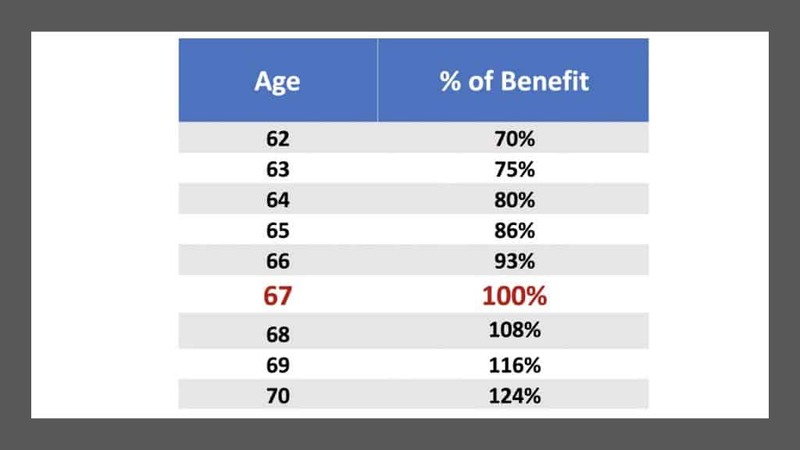 First, you have the 36 month period immediately prior to full retirement age where benefits are reduced by .555% per month, and then anything more than 36 months, benefits are reduced by .417%. What Happens If I File After My FRA? If you file after your full retirement age, your benefit will be increased by .667% for every month. These increases are referred to as delayed retirement credits. It’s important to understand that there is a difference in how the increases and reductions are applied. If you file at any time before your full retirement age, your benefit will be calculated by these reduction amounts and immediately reduced beginning with your first check. That is not the case for the increases. 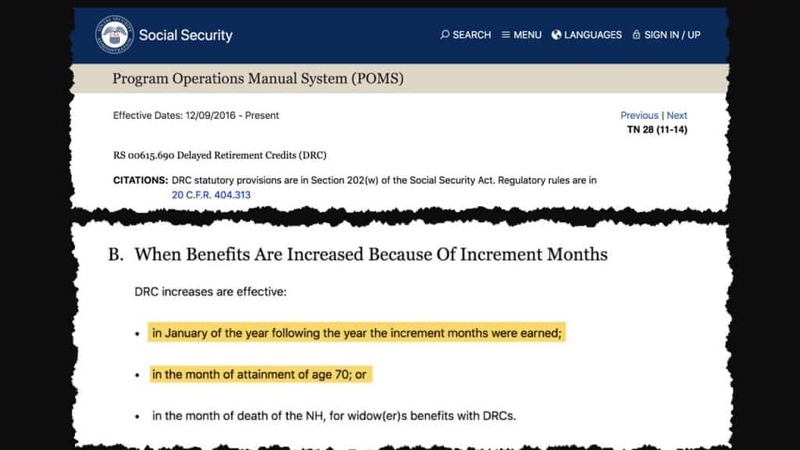 In the operations manual, you can see there are two times retirement benefits are increased for delayed retirement credits. One is in the month you attain age 70 and the other is in January of the year following the year you earned the delayed retirement credits. Should I File Before Or After My FRA? Let’s assume your birthday is in February, and you hit your full retirement age. Six months later you decide to file for benefits and you receive your first check in September. You’ve probably already calculated in your head that you should receive 6 months of delayed retirement credits which would work out to 4% increase to your full retirement age benefit. When you got your first check deposited in September, it may surprise you to see the check is THE SAME as if you would have filed in February. The delayed retirement credits would be added, but not until January of the following year and then you’d see it on your February check. And you don’t receive any sort of payment to make up for those months. One way to lessen the lag is to file later in the year. If you want to avoid this lag altogether, you could wait until your 70th birthday. Then, no matter what month it falls on, the delayed retirement credits are added immediately. Take Action! It’s Your Retirement! You’re making a smart move by learning all you can and reading sites like these, but don’t use this as specific advice for your own situation. I encourage you to do your research and talk to your own advisors. Most importantly, continue to educate yourself and stay curious! 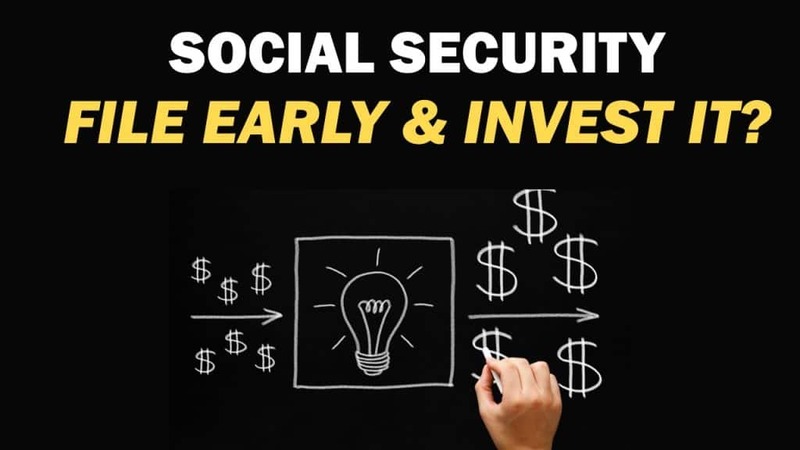 Social Security Benefits: File Early And Invest It? We’re taking a look at the math behind a social security strategy that’s been around for a while. Here it is: File early, invest the monthly benefit, and you’ll be able to generate more income than someone who waited until later to file. Effectively…you can do better on your own. But does it make sense to file early and invest the money? There’s nothing like a decade of positive returns in the market to create optimism for investing. We’re starting to see this optimism affect how individuals file for social security. A few years ago, there weren’t many people saying they were big believers in the market. We were still recovering from the worst market since the Great Depression, and news was still (mostly) negative. A few years later, individuals started seeing a few years of positive returns. Some of those have been double digit returns, and optimism began rising. So, You Think You Can Do Better? Now, I’ve heard things like that for a while, but I’ve never gotten into the numbers to see what was really possible. So…I decided it was time for a closer look. Let’s consider someone with a $2,000 benefit at their full retirement age. For this example, we’ll assume full retirement age is 67. You can file as early as 62 and get $1,400 or as late as 70 and get $2,480. 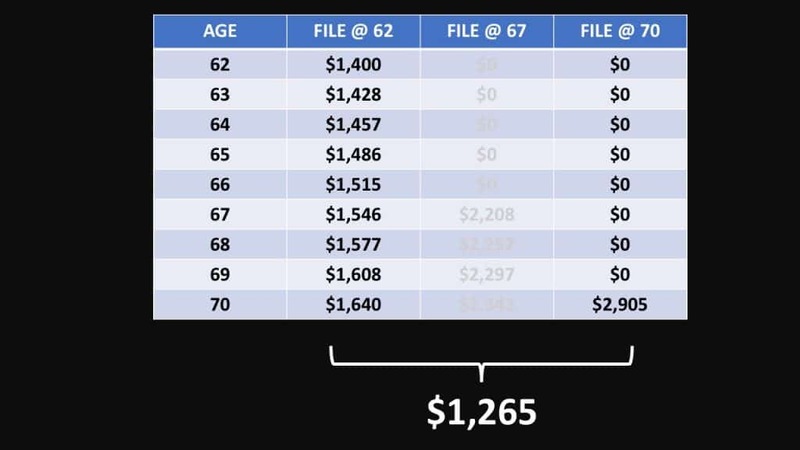 Let’s look at two scenarios: First one is where you need to start your income at 67; and the other is where you need to start your income at 70. In both cases, I’ll assume that you file for benefits at 62. That benefit has a 2% cost of living adjustment (COLA) applied and that you invest the monthly benefits check. First, let’s assume you didn’t make anything. That $1,400 would be worth $87,427. At 4, 6 and 8 percent it would gradually increase and the highest rate of return I assumed was 10 percent where your balance would be $116,985. These amounts would be the available balance to use in supplementing your income. So now let’s look and see what the income gap would be after we adjust for the annual cost of living adjustments. Your benefit would start at $1,400, but by age 67, it would be approximately $1,546 if there was a 2% annual COLA. The age 67 benefit was $2,000, but when you add the COLA to it, that amount would now be $2,208. So there would be an income gap of $662 that you would need to create from the invested Social Security benefits. I’m assuming there are two ways to generate this income. First, is an immediate lifetime annuity. This is the closest thing to your Social Security benefit in that it offers a fixed payment that’s guaranteed for your lifetime. The way these work is that you give a lump sum of money to an insurance company and they send you the payments. The other option I assumed was leaving your money invested and taking a 5% annual withdrawal to supplement the income. 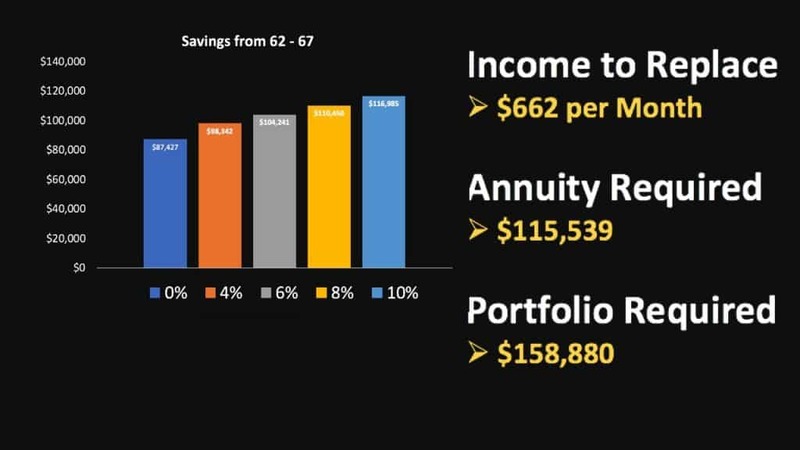 Here were the results: If you need to generate an income stream of $662 per month, it would require an annuity of $115,539 and an investment portfolio of nearly $160,000. For the annuity, this would mean that you’d have to achieve an annual return of 10% and for the portfolio option you’d need to get a return of 21%. Keep in mind…these are the returns needed to break even. You’d have to exceed that to do better that what you’d get with almost no risk from the Social Security administration. I’m not sure how you feel about your capabilities to get consistent investment returns like these, but if you can…maybe you should start a hedge fund. I can tell you that there’s no way I would take that chance with a client’s money. What If You Invest It For A Longer Period of Time… Does That Work Out? But what if you have a longer time period? Let’s say that you don’t need the income to start until you’re 70. In this scenario, you’d have from the beginning of age 62 to the beginning of age 70 to receive benefits and invest them. How would the time/value of money change the outcome? By the time you take your age 70 benefit, it would have grown to $2,905 with an annual 2% cost of living adjustment. That’s an income gap of $1,265 you’d need to cover. Since you’d have a few additional years to invest, the balance of the investment portfolio would be higher than in the prior scenario ranging from 144,000 to 224,000 at 10% annual return. Now we know you may have saved, but how much would it take to replace $1,265? You need an annuity of $200,000, and an investment portfolio of around $300,000. This means that for the annuity to work you’d need to get about a 7% return and for the portfolio to work you’d need about a 17% return. Again…those numbers are just to give you the dollar amount of income that you’d get from Social Security without taking hardly any risk. And, the risk is not the only difference here. 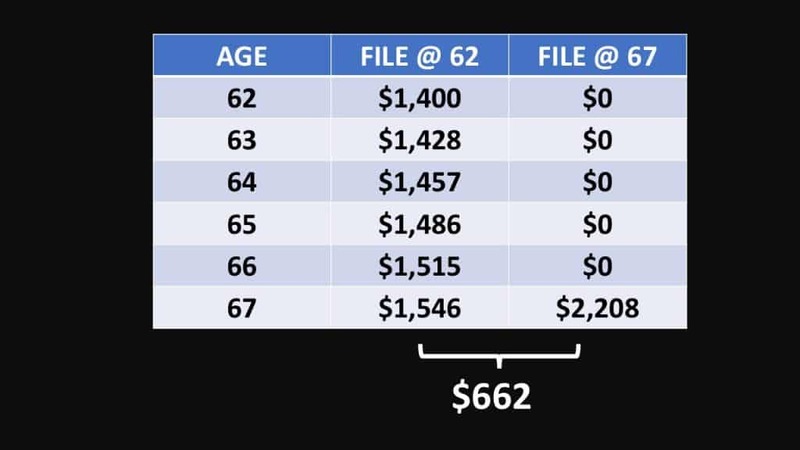 For example, the annuity options do not have survivor benefits, the taxation of an annuity vs. investment portfolio vs. social security is all different so the net amount would not be the same. The annuity options were calculated with today’s interest rates and there’s just no way to know what the interest rates would be in the future and how these annuities would be affected. The investment returns I illustrate are compounded annually and would be slightly different if compounded on a monthly basis. The amount of your social security benefit would also affect the required rate of return on the other options. This article is based on what we know today with a set benefit amount, but your mileage may vary with your own circumstances. Ultimately, remember…I’m not your financial, legal or tax advisor. This article is meant to help educate you, but not as specific advice for your specific situation. I’d highly recommend that you keep learning and stay curious! Are President Trump’s Economic Policies Saving Social Security? 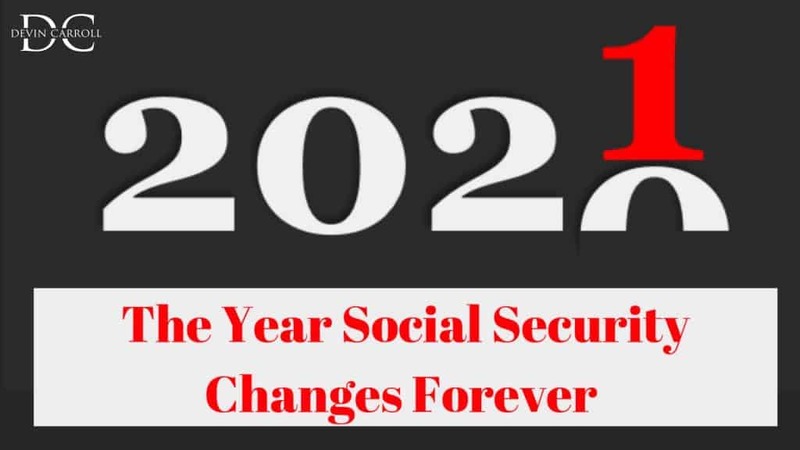 The other day, a piece of economic data came out that is good news for the longevity of the Social Security trust fund. It could mean that the fund DOES NOT RUN DRY in 2034 as was previously forecast. I’ll tell you what it is and why its so important to watch this moving forward. 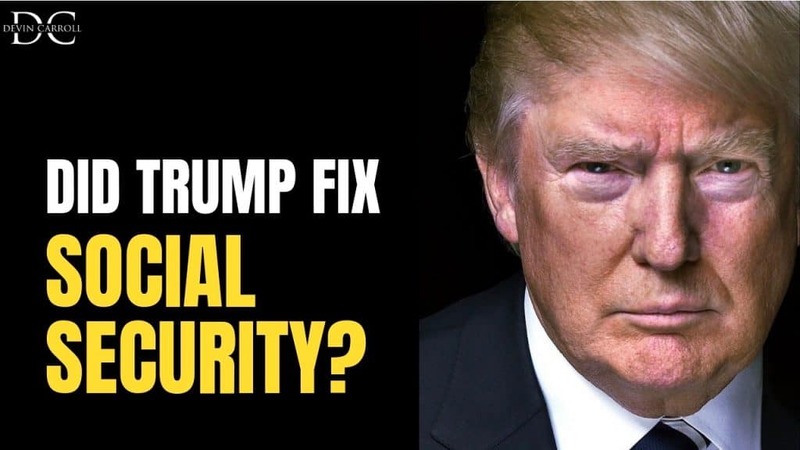 Not long ago I saw a headline that said something like “Trump Administration policies are fixing Social Security.” I couldn’t find the exact one I was looking for but it’s no secret that President Trump has long advocated that the fix is neither benefit cuts nor tax increases, and instead it’s a simple matter of growing the economy and everything will fall into place. And there’s truth to that but we are getting so close to the point where even record setting economic numbers will be too little too late. But what we are seeing is promising! The specific number I’m referencing is the unemployment rate. Economists believe this to be one of the most important economic indicators because of its far-reaching effect. In the Social Security trustees’ report, they list the unemployment rate as one of the factors that will determine how long the funds last. In a very simplified explanation, this impacts the trust fund because with more people working, there are more taxes being paid into the social security trust fund. Thus, the retiree to worker ratio is improved. Now, in this report they forecast an intermediate cost, high cost, and low cost scenario for all of the various factors. The intermediate cost is where they get the assumption that the SS trust fund will be dry by 2034. If the cost goes down, the trust fund will last longer. If the costs go up, it won’t last as long. 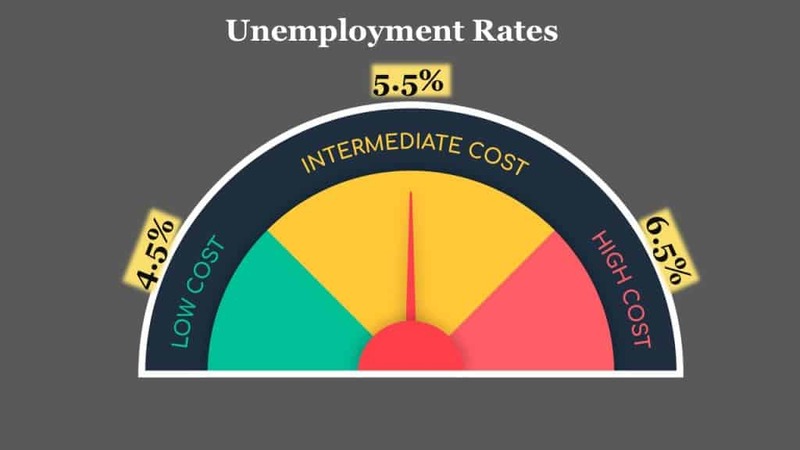 The intermediate cost assumption they are using for the unemployment rate is 5.5%. The lowest cost scenario they show is 4.5%. But, for the first time in a very long time, the unemployment rate has dipped below 4%. As of the last report it was at 3.8%. If it stays down here for long, the Social Security trustees will have to revise their estimates. What Does This Have To Do With President Trump? Well, he’s the president while unemployment rates have been pretty impressive. Since 1969, unemployment rates for the year end have only gone under 4% twice. 2002 and 2018. The question is, is this a result of the policies of Donald Trump? Yeah…I’m not about to answer that. If you look at unemployment rates for the last decade, you can see that except for an increase at first, they’ve been coming down for the last nine years. Is this because of the policies of president Obama? Could it be because of President Bush’s policies before President Obama was in office are finally being felt? We could take this back for decades. 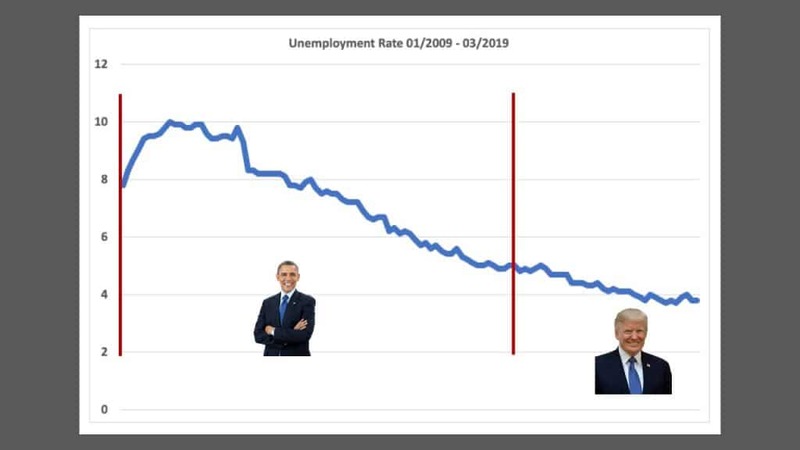 The truth is, I think the President has less to do with the economy than we think. I mean, they don’t control monetary policy, so at best they have short term impacts on the stock market and an indirect effect on the economy. The point is not to play politics or any of that nonsense. Its to remind you that these trustees’ reports are using assumptions THAT CAN and do CHANGE. And as things change, you can count on me to let you know. Before we go, I want to thank you for taking the time to get informed. So many people rely on hope that everything will work out. Sometimes it does, but sometimes a lack of planning can ruin what should be your best years. This is your retirement! Please continue to stay informed! 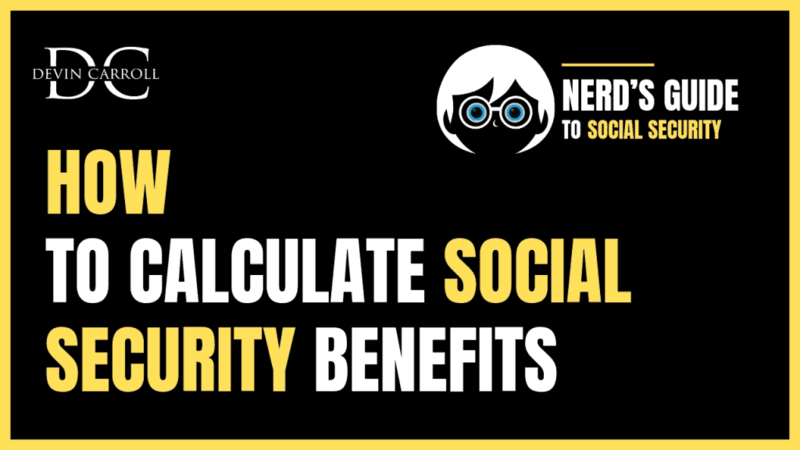 Today, I want to show you how to easily calculate your Social Security benefit without a fancy calculator, software or help from someone who doesn’t really care if the information they give you is correct or not (like you may get at the Social Security Administration). With this article, you’ll know how to do this calculation on your own in just a few simple steps. Why Do I Need To Know How To Calculate My Benefits? That’s true! You can go to your My SSA account online and see an up-to-date copy of your benefits estimate. So why would you need to know how to do this calculation on your own? It’s important for a few reasons. First, it never hurts to understand the mechanics behind an income stream that’ll probably be a large part of your overall retirement income. Secondly, the SSA makes projections about your future income as part of your benefits estimate. This all means that if your earnings are different than their projections, your benefit will not match the estimate. 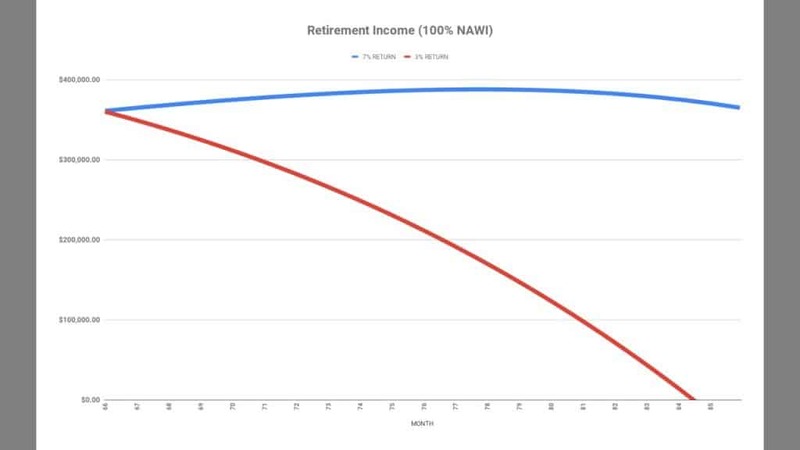 So, understanding how to do this calculation is especially important if you plan to retire early or later than “normal” or if you have a significant earnings change in the last few years of working. To do this calculation, there are only three steps. Each step has some sub-steps as well. First, you’ll need to find your Average Indexed Monthly Earnings, or AIME. Then you apply that AIME to the benefit formula and then adjust for filing age. So let’s jump in with calculating your AIME. To do this, you’ll need to get set up with a tool like Excel, Google Sheets or just a notepad. You’re going to need six individual columns with plenty of room underneath for your information. Set up your columns with the following headings: Year, Age, Actual Earnings, Indexing Factor, Indexed Earnings, Highest 35 Years. The first two headings are the year and your age. Go all the way back to the first year you had earnings that were taxed for Social Security. 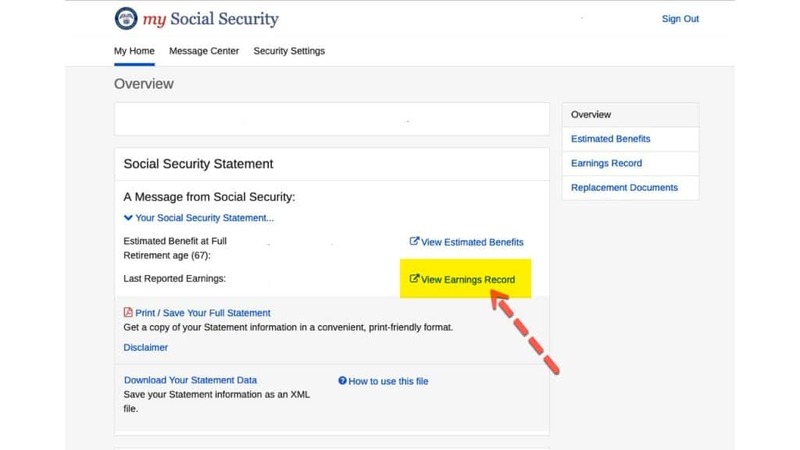 You can find a complete record of this by going to your online SSA account and click the link that says “view earnings record.” If you don’t have an online account, it’s very easy to set one up. This may seem a little redundant to put the year and your age, but it’ll make another step a little easier. Now you just need to copy down the information from the SS earnings history. You’ll want to use the part that says “your taxed Social Security earnings.” Don’t skip a year, even if there were no earnings. Just put a zero in. Once you have all of your historical earnings recorded, it’s time to adjust them for inflation. The SSA uses an indexing factor to make sure your future benefit has kept up with inflation, but still based on your earnings. 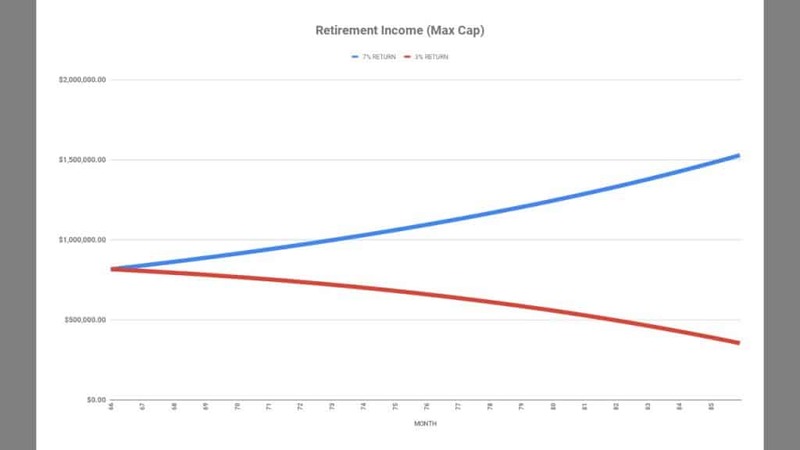 Important note here…only your earnings through age 59 are indexed. All earnings at age 60 and beyond are used in the calculation at face value with no inflation adjustment applied. Also…When you’re getting your indexing factors, you have to be careful to use the factors specific to your age. The easy way to get these is to visit the SSA web page on indexing factors. At the bottom there is a box where you’ll put the year you turn 62. I know I said your earnings at 60 and beyond are not inflated, but their system is designed to give you your factors based on your age of first eligibility. So be sure to put the year you attain age 62 in this box. When you do, you’ll get indexing factors that you’ll need in the next step. You’ll notice that the factor is 1 for the years you are 60 and 61. Now that you have your indexing factors, just copy them on to the sheet. Be sure to keep your years matched up. Once you have your indexing factors written down, you simply need to multiply your actual earnings by your indexing factor. This will give you your indexed earnings. Now, all you have to do is extract the highest 35 years of indexed earnings. NOTE: If you don’t have 35 years, and don’t plan to continue working, you’ll have to use zeros. 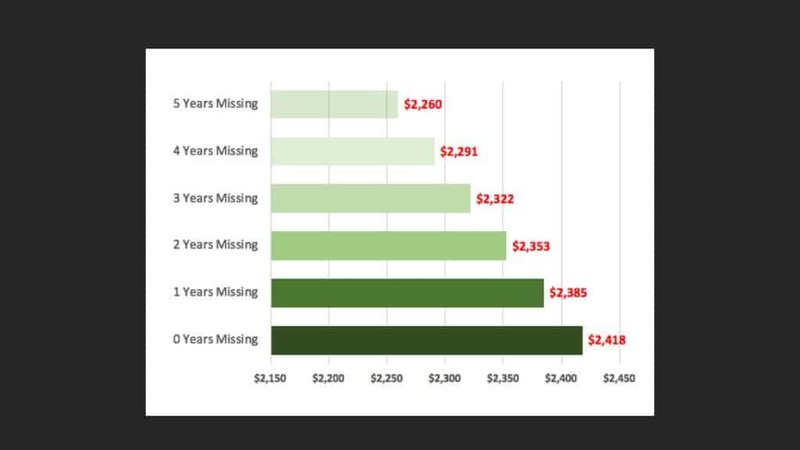 If you’re still working and don’t have 35 years, you’ll need to estimate what your future earnings will be and apply the indexing factors just as you would for actual historical earnings. This is where you can start to play around with the numbers to see the various impacts of retiring early, or working later or maybe having variable earnings close to retirement. Once you have your highest 35 years in the last column, you just need to sum them up and divide by 420. You divide by 420 because that’s the number of months in 35 years and we need to get your average earnings expressed as a monthly number. Once you do this, congratulations…you have your AIME and have finished the first (and hardest) step of the calculation. It’s downhill from here. To keep walking through this example, I’ve assumed a certain amount of wages and years of work. When I do that calculation I get an AIME of $5,726.02. Yours will be different! This was simply the result of my example calculation and I needed an example to continue explaining this calculation. 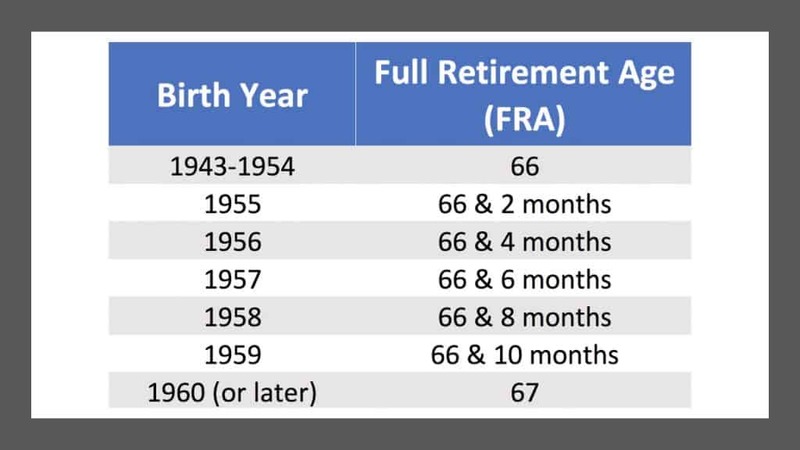 Now that you have your AIME, it’s time to run it through the formula to see what your full retirement age benefit amount will be. IMPORTANT NOTE HERE: This formula is calculated in the year you turn 62. That’s important because this formula is made up of two numbers that’s often referred to as bend points. These numbers change EVERY YEAR AND YOU HAVE TO USE THE BEND POINTS FOR THE YEAR YOU TURN 62 TO GET AN ACCURATE RESULT. Let me show you a 2019 example and then I’ll talk you through how to get these for yourself if you don’t happen to be exactly 62 in 2019. In 2019, the bend points are $926 and $5,583. But the formula is calculated based on three separate percentages of different portions. First you have the amount up to $926, then the amount between $926 and $5,583 and then the amount over $5,583. Three separate portions, but only two numbers. Then you take your average indexed monthly earnings and apply it to the grid. Using the AIME number from my example, the first $926 would be used at 90%. The amount from $927 to $5,583 would be used at 32%. Anything over $5,583 would be used at 15%. Once I’ve ran my AIME through that grid, I simply sum up the far right column and the result is my full retirement age benefit also known as my PIA or primary insurance amount. But what happens if you aren’t 62 yet? In that case you’ll have to forecast what bend points will be in the year you turn 62. Thankfully…it’s not that hard because I have a calculator on my website. The first thing you’ll want to enter is your year of birth. This will do the math for you to figure out how many years until you turn 62. Then you need to put in the current year bend points. I’ve left this field unpopulated since they change every year. To get the current year numbers, just click on the link for the SSA page that has these numbers. Just be sure to use the bend points for the PIA formula and not the family benefit formula. Once you have the current bendpoints plugged in you need to decide how much inflation will occur. In my calculator you can choose 2, 3 or 4%. The Social Security trustees believe the average wage index will increase at around 4% per year, and this index is what controls the bend points, but you may choose to believe that’s too optimistic and want to use a lower number. This is completely up to you. Once you hit calculate, you’ll see the future bendpoints below. This is what you would use in your formula. Keep in mind that the bendpoints change every year, but the percentages stay the same. One other thing…if you are beyond age 62 you can find the bend points for the year where you were 62 at that same link. Now that you’ve calculated your average index monthly earnings and applied them to the PIA formula, you simply need to figure out how your filing age will impact your benefit amount. The easy way to look at it is to think about it in annual numbers. Your benefit will be lower if you file at 62 and higher if you file at 70. But there are three separate bands with different adjustment amounts. The red line is your full retirement age. This is where you receive the amount of the benefit you calculated plus any cost of living adjustments that happen between now and then. If you file after your full retirement age, your benefit will increase by 8% per year. If you file in the 3 year window immediately prior to your full retirement age your benefit will decrease by 6.66% per year of early filing. For anything more than 3 years before your full retirement age, your benefit will decrease by an additional 5%. A lot of people don’t want to retire on their birthday so it’s important to break this down by a monthly amount. 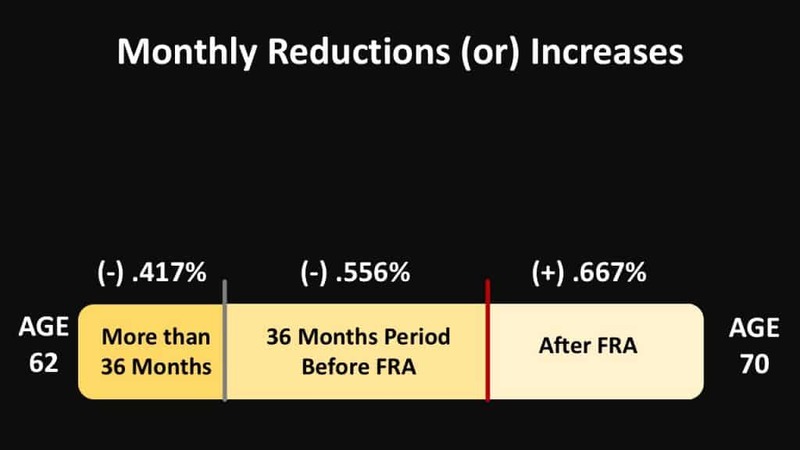 After your FRA, your benefit will be increased by .667% per month you delay. For the 36 month period before full retirement age your benefit is reduced by .556% and for more than 36 months it is reduced by .417% per month. Before we go I want to thank you for taking the time to get informed. So many people just float into retirement hoping everything will work out. Sometimes it does, but sometimes a lack of planning can ruin what should be your best years. This is your retirement! Please continue to stay informed! Whether you are close to retirement, or in your early working years, there is a step that you need to take today. It can’t wait! If you ignore this it could cost you THOUSANDS of dollars in missed Social Security benefits. And its just a small little step that will take less than 5 minutes. I’ll tell you what this mistake is and the steps you need to take TODAY to avoid it. 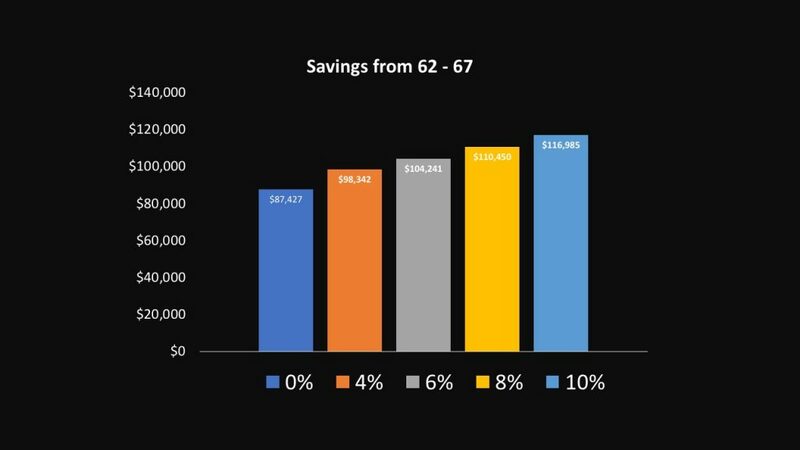 So what is this little step that you can take that may help you avoid a big reduction to your Social Security benefits? It’s a mistake in your Social Security earnings record. This earnings record is a history of your lifetime earnings that will be used for the purpose of calculating your Social Security benefit. If your Social Security earnings have been recorded incorrectly, or worse…not at all…it could make a big difference in your benefit amount. Why is this such a big deal? It all goes back to how your benefit is calculated. The Social Security Administration uses your highest 35 years of earnings as a cornerstone of the benefit calculation. If any of these 35 years are incorrect, or missing altogether, the average is skewed. Mistakes in the Social Security earnings record are fairly common. For proof, look no further than the Earnings Suspense File. (This is where earnings reports are stored that have a mismatched name and SSN combination.) Since the inception of Social Security, there have been a total of $1.2 trillion in wages that could not be matched to an earnings record and thus were added to the Earnings Suspense File. In tax year 2012 alone, the Social Security Administration reported $71 billion added to the file! Why are there so many mistakes? Most of these mistakes are not the fault of the Social Security Administration. A good number of the mismatches are due to employer reporting errors or simple name changes after marriage or some other clerical error. Thankfully, the Social Security Administration has a pretty good system for figuring these mistakes out and assigning the earnings to the correct record. The other mismatches are often legitimate earnings that just never get corrected. Unless you’re vigilant about monitoring your earnings record, you could have earnings gap that could have a substantial impact on your Social Security benefit calculation. I used the actual online calculator from the Social Security Administration. I love this calculator. It does have some limitations but as far as I’m concerned it’s the best calculator on the SSAs website. If you want to follow along you can just go to the Online Calculator. Individual has 35 years of earnings that started in 1984 and ended in 2018. Instead of going for a really high annual earnings amount, which would have exaggerate the effect, I assumed that this individual started in 1984 with a salary of 35K and had a 2% raise every year. 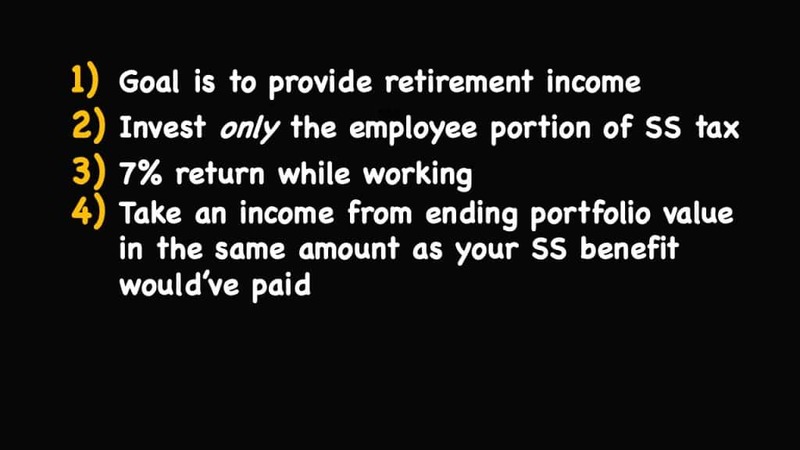 Now this video is all about doing this calculation for yourself, and to do that you’ll need your own earnings history. Under that assumption, this individual would have a full retirement age benefit of $2,418 dollars. So that’s the baseline. What happens if earnings are missing? At random, I started at 1990. For one missing year, the benefit would decrease to $2,385 dollars. For two missing years, it would decrease to $2,353 dollars. For three, it would be $2,322. 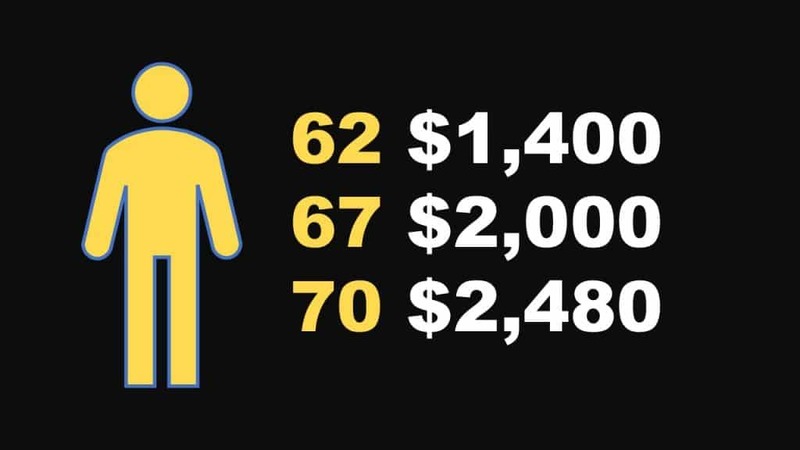 For four, it would be $2,291 and for five, it would be $2,260…a difference of $158 dollars per month. So you may be thinking…Devin…that doesn’t sound like such a crisis. But how would this affect you over your entire retirement? If we take those same amounts and assume a annual cola of 2%, you’ll see that the effect is now measured by thousands of dollars. For one year, it’s nearly $8,000. For two, it’s over $15,000. For three, it’s slightly over $23,000. At four years, it’s more than $30,000, and at 5 years, it’s nearly $38,000. I don’t think anyone would willingly give up any of those amounts. Hopefully you’ve seen the value of making sure this earnings record is correct…heres how you can check yours. Go to ssa.gov/myaccount. Once you log in you should see “earnings record” in the right hand sidebar. Once you click that you’ll see a complete copy of your earnings history. It’s that easy. The hardest part is remembering the security questions when you log in. So what happens if your earnings history isn’t right? If there’s a mistake, here’s how to correct it. First, gather your proof of income. This could be from tax returns, W2s, 1099s and a few other documents. If you can’t find these…don’t let the SSA tell you that there’s nothing that can be done! In their manual, they state that an oral or written statement from the employer will serve as primary evidence of wages. Once you have this proof of income you simply need to contact the SSA. They may have you fill out a SSA-7008 or they may do it for you. Just call the main number or your local office. Earlier, I referenced a time limit for correcting an earnings record mistake. Generally speaking, it is 3 years 3 months and 15 days. There are exceptions and there’s one BIG exception that covers almost everything. They will revise the record to correct a mechanical, clerical or other obvious error. About the only time I interpret when an exception doesn’t apply is when you didn’t file your taxes before the time limit. You’ll still have to pay the SS taxes, you just won’t get credit. So you may be asking yourself, why all the fuss and urgency? Here’s why. Like many of the Social Security rules, the rule on time limits are broad and sometimes not completely understood by the technicians at the Social Security Administration. I’ve seen cases where there was a clear exception, but the technician refused to enter the earnings because they did not understand the rule. Thankfully, this client was able to get help from a financial planner who understood the rules and helped the client draft a request for review letter. A few weeks later, the earnings were back where they should be…on the client’s earnings history. Listen…please do this small little step today. It could make a big difference to you and potentially your survivor benefits if you should pass away. Before we go I want to thank you for taking the time to get informed. Being informed gives you choices – and can make a big difference in YOUR RETIREMENT! Please continue to stay informed! 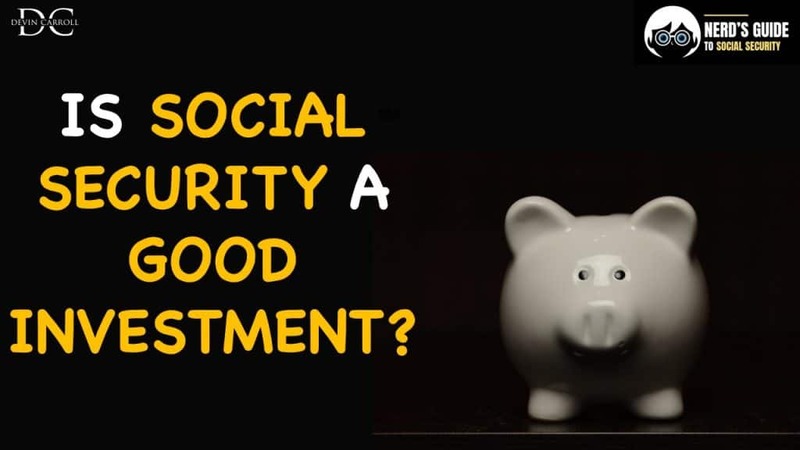 Is Social Security A Good Investment? Investing the tax you pay in or sticking with Social Security? To get the results I made a few assumptions. First, I assumed that your goal would be to create income in retirement as opposed to buying a vacation house or something else that would require a lump sum. Second, I assumed that you took only your part of the SS tax and invested it. For a refresher…the total FICA tax is 15.3%. If you are an employee you only pay ½ of that or 7.65%. Of that amount, 1.45% goes to Medicare and 6.2% goes to Social Security. It’s that 6.2% that I assume you invest. Then we assume a 7% return. Obviously you may do better than this or not as well as this. At your full retirement age, the invested balance would be used to fund an income stream that would be equal to the amount of SS for which you would have been eligible. There are multiple ways to illustrate the withdrawal, but this is the only way to keep it apples to apples. Finally, I looked at multiple income levels while working in a job from age 19 to 66. To get a baseline I used the national average wage index which is published by the Social Security Administration. The first income level was for an individual at 50% of the national average wage index. Then I looked at 100%, and then at 150%. For a maximum SS benefit, I also looked at an individual who would’ve earned the maximum taxable wages for every year he or she was working. 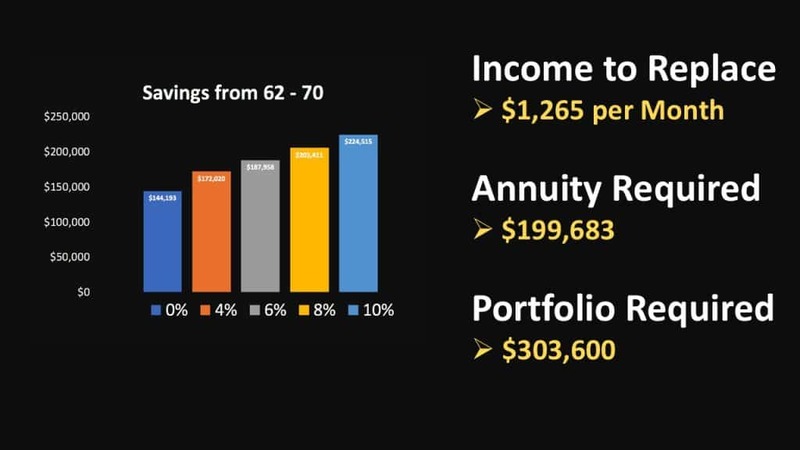 With these earnings figures, I used the calculator on the SSA website to calculate what the benefit for each of these income levels would be at full retirement age. I then increased that amount by 2% per year to keep up with the SS cola. That is the number that I illustrated withdrawing from the portfolio accumulated from the invested SS taxes. I don’t want to overcomplicate this, but at this point there is really another assumption to consider. Would you continue to get 7% return in retirement, or would you move your money to an investment that may have less market risk? For an individual at 50% of the average wage index, the portfolio value would last beyond the expected 85 year life expectancy if invested at 7%. If the portfolio received a 3% return, it would run out at age 80. This is because a lower income individual would have a larger SS benefit relative to the amount of taxes they’ve paid in. So the withdrawal percentage would be higher for them. Next I looked at an individual at 100% of the National average wage index. At 7% their money would last well beyond age 100. At 3% return they would be out of money at age 84. 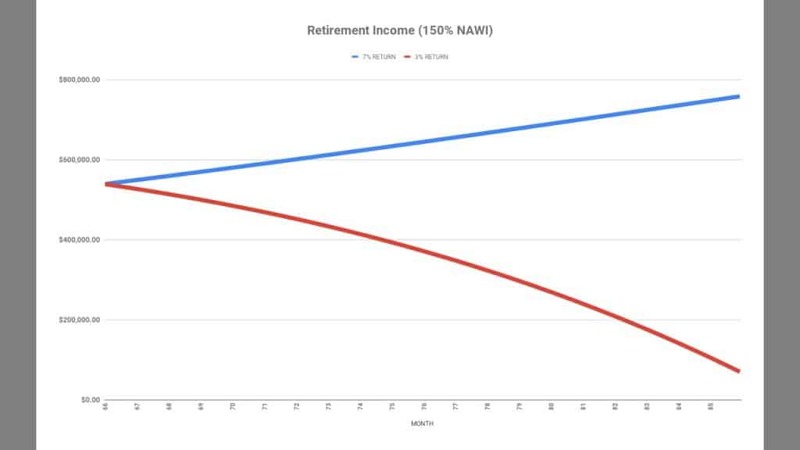 This is where things change… If an individual had earned 150% of the NAWI they would see their benefit increase and would have more in their account when they died than when they started. At 3% it would still last until around age 90. And finally an individual who had earned the maximum wage base on an annual basis would see similar results except this time they would never run out of money in either scenario during a normal life expectancy. To make sure my numbers were right, I spoke with Dr. Brandon Renfro. Dr. Renfro is a finance professor and a numbers guru. Things checked out! So what’s the point of all of this? Can you opt out and invest it? No you can’t. This is mostly to satisfy the curious who have wondered…could I do better on my own. It appears that the answer to that is your income level. If you’re lower income, it would be tight. If you’re higher income, you probably could. Hey remember…THIS IS YOUR RETIREMENT. Stay curious and STAY INFORMED. You’re making the right moves by reading articles like these, but don’t use this as specific advice for your own situation. Do your research and talk to your own advisors. Most importantly, continue to educate yourself.